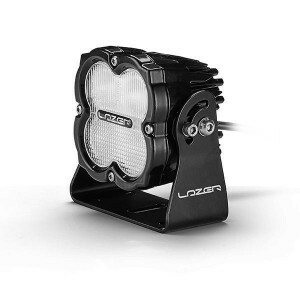 Comprising the same heavy-duty aluminium casing and interchangeable lens options, the Utility-80 shares the same physical characteristics on the outside as the Utility-45 work lamp, but inside upgraded electronics alongside 4x20Watt high density LEDs, deliver incredible lighting performance contradicting the lamps relatively diminutive size. Lenses are easily interchanged while maintaining the lamps IP67/IP69K rating. Built to last with a 2 year warranty as standard, the Utility-80 benefits from automotive grade corrosion resistance, while the integrity and functionality of the lamp is further enhanced through EMC protection which ensures no interference with any other electrical machinery or appliances. Over voltage and reverse polarity protection will further guard against accidental damage and increase the longevity of the lamp. Supplied with male/female Deutsch connectors (part no. DT06-2S/DT04-2P), optional extras include: a One-Lamp Wiring Harness Kit, and Quad-Core Dampening System to protect against extreme vibrations.